Sadly, this no longer seems to work in 10.9. I’ve a bug logged with Apple (ID: 15339885) since 29/10/13 & as of yet this issue is still outstanding. The change password box still appears on the day of expiry, but sadly doesn’t stop users from not able to login if their account expires over a weekend. Others are finding the same, & i’d also agree with the advice given in that thread by Apple Support to look at: ADPassMon. Thank you for your contributions to the Mac community it is a blessing. 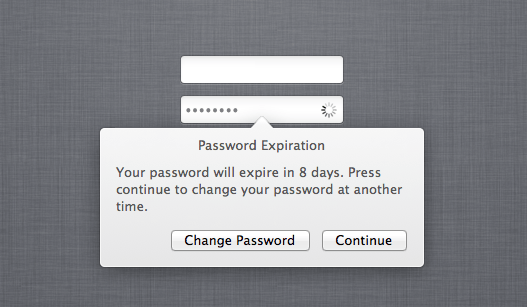 I just tested 10.9.3 buil 13D28 and the password expiry warning seems to be fixed. dang it! I’m on 13D21.. will updated once 10.9.3 is released proper. Thanks for advising. Do you know if the issue with Mavericks has actually been resolved? 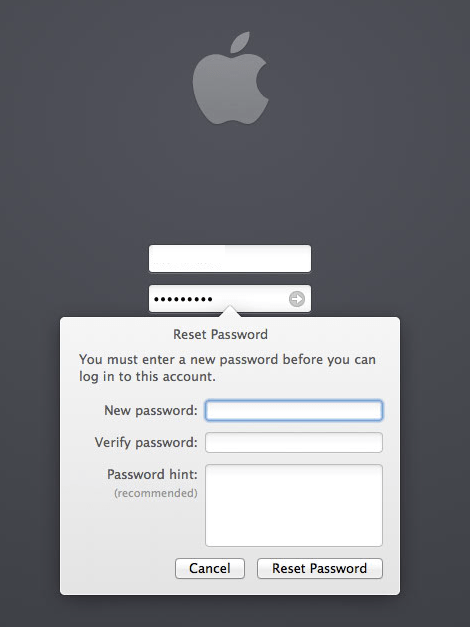 in my environment it still does not prompt for password reminders and we are running 10.9.4 (13E28). We are getting it only once. The first time a domain user logs into the machine they get the notice. Subsequent logins for the same user get nothing. I have a ticket opened with Apple, but it is with their engineering group. That means who knows when it will be corrected. The fact that they made changes and it started to work makes me think a resolution is coming. I will post here once I get a working fix. Thanks. Please keep us updated. Still not resolved for me on 10.9.4 either. Per Apple, this will not be resolved in 10.9. This is corrected in 10.10 DP7 and higher. I have verified here and escalated based on the fact that I have 100+ broken machines.